Presentation Zen: Should lectures be conversational? Do you believe that audiences – say a room full of college students, for example – will pay better attention and learn more from a presenter who speaks in a very formal style or a presenter who speaks in a more informal, conversational style? Assuming both presenters have solid, accurate content, which style is more effective? Yes, each case is different, but more times than not, a conversational style is a better choice in my experience. Kathy Sierra over at Creating Passionate Users says that our brain wants a conversation. Whether we are listening to a lecture or reading a book, a conversational approach with the reader or listener is often the best approach. 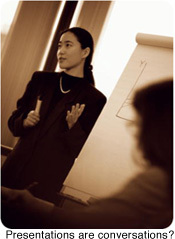 Kathy is one of the authors of the Head First series, books which do a unique job of presenting instructional and technical information in a very visual, conversational, and compelling way. Although I am not much interested in writing code, I purchased the Head First Design Patterns book simply because it is a good example of presenting potentially "dry" technical information in a way that is engaging without being "dumbed down." I tend to agree with Kathy when she says "...the more advanced the topic, the more you NEED to pull out all the stops in trying to make it more understandable." This is the design thinking behind he Head First series, an informal approach and style she says allowed them to take technical information and go deeper than if they would have used very formal language. "...the more advanced the topic, the more you NEED to pull out all the stops in trying to make it more understandable." How about lectures or presentations? Essentially, Kathy is saying this: When you present in a conversational way, the brains of your listeners think they are in a conversation and have to hold up their end of the conversation by paying attention. Conversations, after all, are not one-way. Kathy points to some research such as e-Learning co-authored by Richard Mayer which seems to support the idea that an informal, conversational style is often a better way to teach. What do you think about this statement by Kathy Sierra? "If you're using formal language in a lecture, learning book (or marketing message, for that matter), you're worrying about how people perceive YOU. If you're thinking only about the USERS, on the other hand, you're probably using more conversational language." She admits that this is a very large generalization, but what do you think? Does this not ring true in many cases? I think you will agree that the best presenters/lecturers have the needs of the audience foremost in their minds. When asked why they use such a formal style, many presenters will say something like "I choose to lecture in a formal style because I want the audience to take me seriously and respect my content..." But is this not an example of the presenter putting his needs ahead of the audience's needs? After all, "I am concerned about what you think of me" is not a statement which expresses concern for the other. So, if we choose to stay behind a podium, read from a script, or use a very formal "traditional lecture" approach, we need to ask ourselves why. If the reasons are because, for this particular case, it better serves the needs of the audience, then fine. But if the answer is "because I feel more comfortable" or "because it is what everyone does" or "because I want to appear to be ______" then we may not be giving the audience our best work. Ask yourself or your team the following questions: Think about your own presentation style: Is it quite formal? If so, why? Is your presentation style conversational? Again, if so, why? Do you change your style or approach depending on the audience or topic? Do you present differently in one country from another? Examples? Do you choose your approach because you feel (know?) it is the most effective delivery method for the particular audience, or is it because it is what you're comfortable with? If your style is quite formal, what would happen if you tried presenting once in a more conversational style? I discovered the value of conversational style the hard way -- I was giving a lecture in Japan, and when I arrived at the venue discovered two things: that instead of 20 attendees there were almost 300, pulled in from offices all over Tokyo, and that my translator hadn't shown up. So the canned version of my presentation got promptly tossed and I winged it all through with one of my Japanese colleages translating on the spot. My only metric for quality was the faces of the audience members. Afterwards we got back some survey forms and they were through the roof! Comments like "we have never had so passionate a speaker here, please come back again" etc. Gratifying AND illuminating.